Forming a list of values may be the one thing we can do that can literally change everything for us. That one exercise that can allow us to figure out what we want and how to get it. And the path to getting these things is by defining our values through a list that represents what means most to US. Not what people want us to be or who they want us to be. What WE want us to be. That when we truly create this list from our hearts, we can feel as sense of purpose for our lives. And a sense of pride that we are setting up a life where we operating from values and standpoints that mean the most to us. It frees us up to become complete independent and individualistic. Keeping us from moving with the crowds. And instead standing alone and have the internal power to do so. Because or moral compass is satisfied. Brain Tracy talks about how we cannot reach our highest levels of success and self confidence until we clarify our values. What do you know that you stand for. Or even would die for. When we have created a list of values for ourselves, it helps us make better decisions. These values are non-negotiable. They need to be consistent with our personalities 100 percent of the time. You can’t switch it on our off when convenient. Either you live in through and through. Or you don’t have it as one of your values. Our values permeate through us. There is not even a need to verbalize them because they speak loudly through our actions. To the level that you devote your life to these values. And act in accordance to them. Is in direct correlation of the level of self confidence you experience. This is because when what we think is in line with our actions, we feel good about ourselves and our lives. When we compromise, we simply don’t feel good about it. Mind the morbidity of this exercise. But it can help immensely to think about what people would say about you at your funeral. How they would describe you as a person. What core values would you want to be remembered by when someone is giving a speech about you? Which things would you want them to say? When it comes to this exercise, we want to write the values that mean the most to us. And then scrap all but one. Take two at a time and then scrap the one that doesn’t weigh as heavy on your heart as the other. Keep doing this until you only have one left. This will be your ultimate core value that guides your entire existence. So say you value FAMILY. This is your ultimate core value. Well then that means that you will put family over EVERYTHING. This means work, God, health. Every single thing. We can also think about the people in our lives that we admire most. Or even famous for non-famous people that have passed away. What did we love about these people? What did we see in them that really made us trust or admire them? Maybe it was that they were courageous. Or flat out honest about everything. Think about a couple of people you admire the most. And list 5 qualities each about this person. What are things about certain people in this life that really piss you off. Traits or personalities that just flat out don’t resonate with you? You can again, pick a few people and list out a couple qualities that you do not like about them. This can mean that you place much value in the exact opposite. For example, maybe you know someone who is very aggressive and angry. So to you, maybe being gentle is something you value. Become aware of how you react during stressful situations. For example if you highly value being calm, but get incredibly pissed off when someone cuts you off in traffic, then calmness as a value may not be in line with what you truly value. Or simply it may be something you you need help with. And need to work on more and more until it becomes natural to be calm in situations that used to cause you distress. All in all, like a I talk about in my post about CORE VALUES, peace of mind, as suggested by the man Brian Tracy, talks about how we should put peace of mind as number 1. I am not trying to tell you what to do. But putting peace of mind as #1 will allow you to create a quiet mind. That whatever you do, you won’t have mental and internal turmoil. If you guide your life with choices that support peace of mind, you can never feel badly about yourself. And as a result, self confidence blossoms. What are you discontent with in your life? Or even what do you want to change in your life? You can make this a new value for your life if you are utterly and completed devoted. For myself I want to make health a top value in my life. Because I was eating pretty good, but I wanted it to define my life. And it is something that I felt that if I mastered, I would bring that mastery into every other area of my life. Because I see food as a drug in some sense. That if I could master my eating habits. Cook whole foods. Eat at home for almost every single meal. Then I could master one of the toughest domains humans have to deal with. What would be the one value you could integrate that would bring about massive positive change if you adhere to it? You have that power. I promise you that much. I feel as if values don’t need to be about the way you are already living. You can do them this way. But if you reach a point of disgust with how you are living, then you can use values to help you drastically alter your life. To where you become someone that people you know don’t even recognize anymore. Transforming yourself from the inside out. Cultivating a list of values for your life can be a growth provoking journey. But it will save you a lot of time. Because it will show you where you are going and want to go. Hence giving you a map in a sense, of your life. Each value you put should be in accordance to how much importance you put in this value. As I said above, your top value overrides all others. So if you want family as your first value and then HEALTH and GOD as your second and third, it means you would sacrifice your health and God over doing things for your family. You have to put in perspective what the world VALUE really means. It is what we would essentially pay for something. Payment being how you choose to live your life. You are paying in breath and effort that we will never get back. As one more day spent living is only one more day spent getting us closer to death. We can’t get this time back. So creating things we value so much that we would live our life through, is valuable stuff. Worth it’s weight in gold a 1000 times over. So I want to encourage you to fully adapt them to YOU. Again, I know I said this in a sense already, not who someone else wants you to be. If it means that it takes you a month to create this list for yourself. Because you have reflected and really dwelled on it. So be it. Try them on. Try them on for size. And wear them until they become permanently ingrained in you. Like a tattoo. 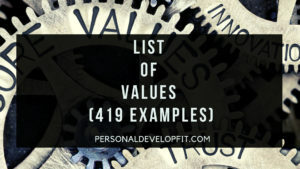 Below is a list of values listing from A-Z. My suggestion is that you have 5 main values and that is how you live your life. You will notice that certain values can fall into other values are sort of subcategories. Which when you live the main core value, than you naturally live the other subcategory values. So don’t get to caught up in making too much of an exhaustive list. Find what truly resonates with your HEART and not your MIND. If there is an internal battle between the two, always go with the decision of your heart. Somehow it truly does already KNOW what we truly want and desire. For more awesome ideas for values starting with C, visiting this awesome site. Positive words starting with C.
For more great positive words that start with D, check out this great post! Positive words that start with D.
For more great words that start with E for ideas for good values, check out this list! List of words that start with E.
For more great core values starting with the world F, check out this list! Words that start with F.
For more awesome words to use for your list of values starting with L, check out this link! Words That Start With L.
For more words starting with P, check out this list! Words that start with P.
For more great words for values ideas starting with S, check this list out! List of values starting with S.
For more words that you can use for your values list, check out this link! List of values that start with W.
There you are my friends. A list of values that you can integrate into your life as a way to guide your each and every decision. I truly believe that the more you commit yourself, the more you can make any value massively apparent in your life and to the people around you. Treat this process with seriousness. Life is serious business. Having a plan for your life is serious business. The pursuit of happiness is serious and sacred business. You are essentially creating a business plan for your life. Which the payoff for doing so is ultimate fulfillment, joy and a feeling of fulfilling one’s destiny. Take this matter seriously, because this is a matter of the heart. And all matters of the heart must be treated with the utmost respect. Share with me what you liked about this article as well as what values you are thinking about putting on your values list! As well as if you have any good ones to add to the list! I want this baby to evolve and know you guys have a great input that we can all benefit from!